Do you remember the statement “content is king”? I am sure you do. And there is something behind that. If you want some statistics on how many articles are published every day, I have some numbers to reveal you. According to MarketingProfs it is more than 2 million articles per day. Chartbeat reveals the following numbers – over 92, 000 articles every 24 hours. Impressive, isn’t it? Despite the numbers, people face the problem of writing new fresh posts every day. Nevertheless, they find ideas and turn them into awesome content. I am not surprised with all these questions because I have already found the answers. The answers that helped me write a brand new blog post almost every day (I am a human, I need some rest as well). I am pretty sure you want to write on a daily basis without any problems, am I right? Thus, this post is for you! 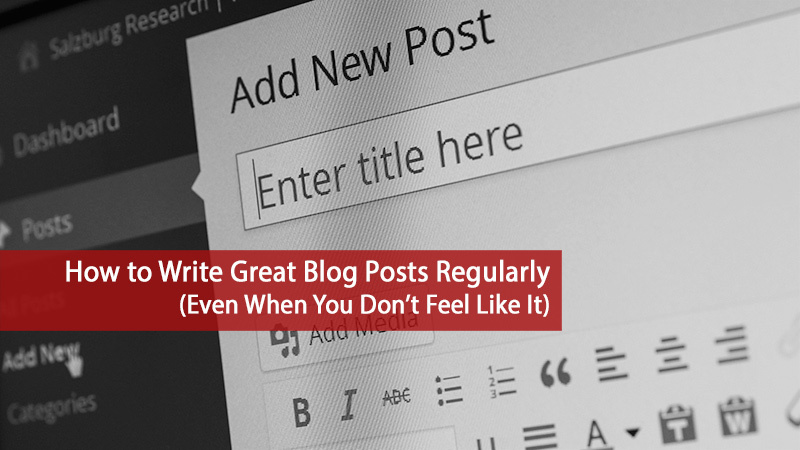 I will show you the basic steps towards successful guest posting. Are you ready? SIDENOTE: if you need some SEO tips, you should read this 200+ SEO tips guide. What about a ‘Pomodore technique’? 2. Need a Fresh Guest Post Idea? No Problem! 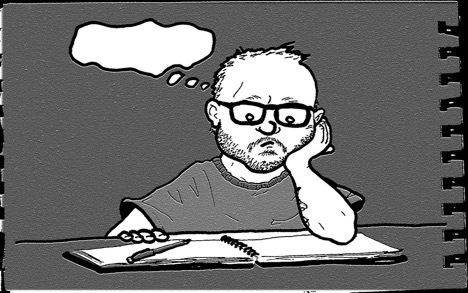 I believe there is no writer in the world who has never ever been a victim of a writer’s block. Let’s imagine that you are an engine that produces ideas for new articles. You might work a month in a constant condition; nevertheless, you will face the problem of absence the ideas for new posts anyway. The reason is pretty evident. Our brain needs some rest and if you bring nose to the grindstone, you will get a zero result. Likely, you can fix this problem following a few simple but yet effective rules. It is very important to have a right working day schedule. However, you should start with your sleeping one. There are various points of view on how many hours a person should sleep every day. Some people claim that it is normal to sleep strictly 8 hours; the others suggest to sleep about 6 hours. From my perspective, it is up to you how many hours you should sleep but I strongly recommend you to go to bed before the midnight. Remember that we are living beings, thus we must go to sleep when it is getting dark and wake up when a day is breaking. Perhaps, it is a standard to work 8 hours per day and that’s why we are used to start our working day in the morning. Alas, it is a bit hard to leave the bed and drown yourself in work without a few morning ‘attributes’ such as physical exercises, a contrast shower and a cup of coffee (tea). I heard some experts state that it is far better to start writing an article being hungry. It is believed that your activity will be higher in this way. Again, it is up to you whether you should have a breakfast before writing a post or not. I, personally, disagree with this statement and I can’t start doing anything before I have a solid breakfast. When it is time to write a piece of content, you must specify for yourself how many breaks are you going to do and how long each break should be. Don’t limit yourself with breaks because your endless sitting in front of the screen of your PC won’t give you any positive results. I prefer to do about 3 breaks during my working day. Of Course, I don’t take into account my lunch break (1 hour in the afternoon) but these 3 breaks take approximately 15 – 20 minutes each. I like to get a little exercise and switch attention to the things outside the window. Moreover, it would be great if you could have a communication with your relatives (friends) or listen to the music. By the end of the working day, I would suggest you have a walk in the street or visit some gym. You must unbend the mind and let your body work. And don’t neglect your sleep if your brain asks about it (I mean no watching TV long after midnight). • Print your list of tasks if even you can’t login to the device. • Repeat your tasks, notes and share them with other people. This app focuses mostly on the most significant tasks you must do over the week. It is pretty easy in use and all you will have to do is to put your tasks according to the priority each of them has. As your main purpose is writing articles, you may put this task atop. Another one ‘ToDo list’ tool you can use for planning the working week. User-friendly and you won’t miss anything using this tool. If you want to improve your work but you don’t know how to do it by yourself, thus you should use this unique technique – Pomodoro technique. It “sets” you for working 25 minutes without any distractions from the outside. Basically, you can’t do anything else except writing an article (no phone chatting, no listening to the music etc). After each 25 minutes of work, you should do a 15 minutes break (after four ‘Pomodoro’ sets you will have to do a 30 minutes break). From my point of view, this technique is really useful and you’ll gain a success following this simple “Pomodoro” rule. Yes, this is, probably, the worst thing that could happen to a writer. The absence of ideas for a new post. I know the questions that revolve in your head when you have no idea what you should write about. Relax! Every question has the answer to it. Thus, I will share with you some tricks on how to find fresh ideas for the post. As you can see any keyword you put into a searching box will reveal you the potential topics for your future post. Considering the example I gave you above on ‘Digital marketing’, I must say I wouldn’t change or rephrase anything (just a bit if you want). These questions seem to be great topics to think about. 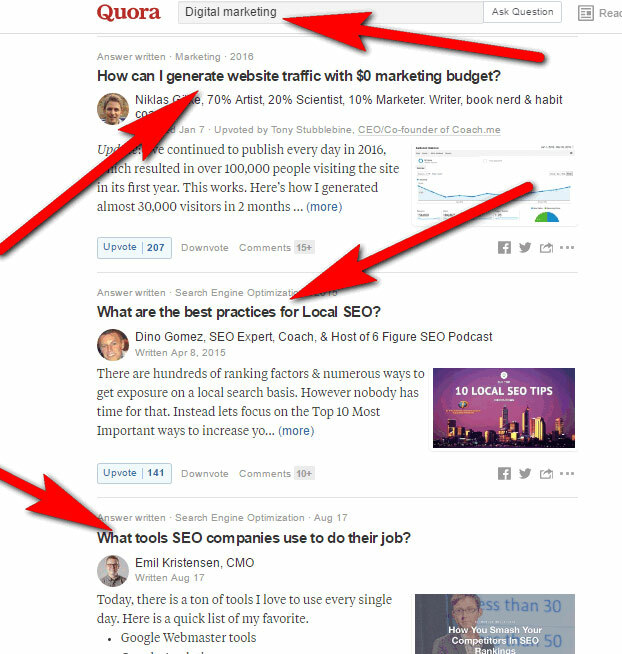 Well, do you still have some doubts about getting ideas via Quora? I am sure you don’t! I believe you’ve already guessed what is the first place where you should look for guest post opportunities! Yes, it is Google. The second trick I like the most is searching via Twitter. 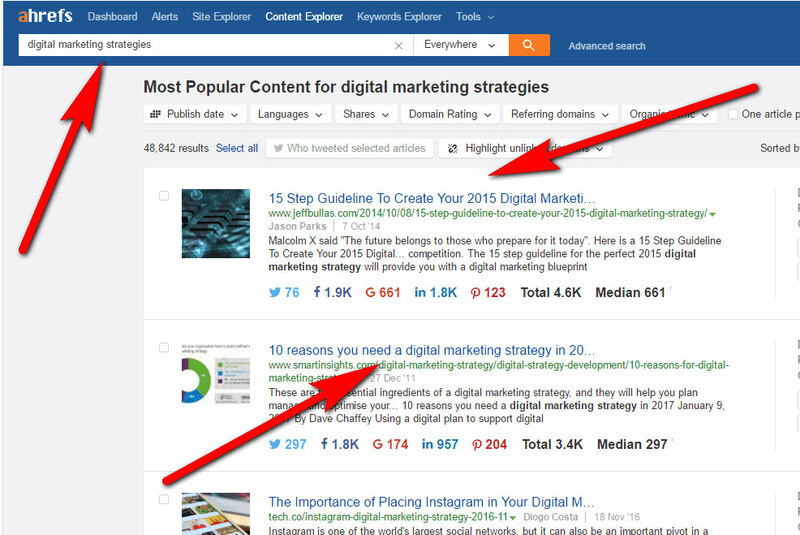 Yes, it is far better to search for guest post opportunities using this social network. 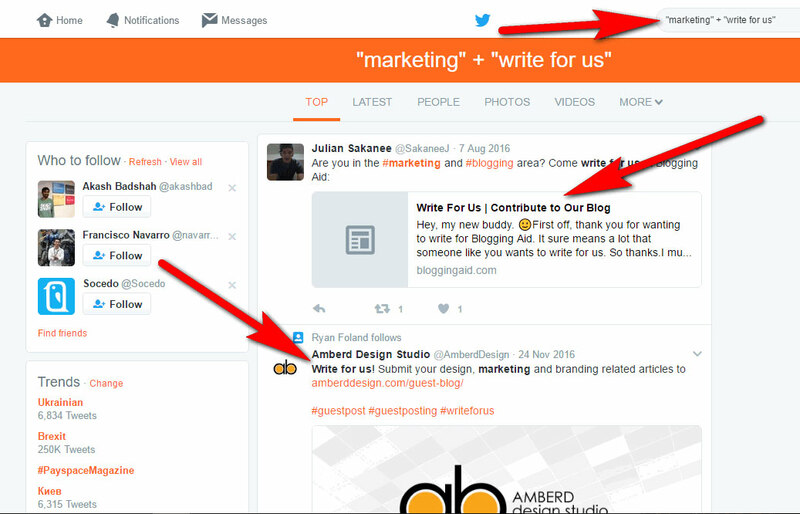 Put into a searching box something like “marketing” + “write for us” and obtain results. 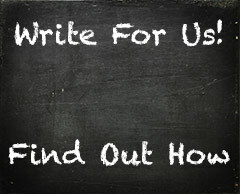 Moreover, I must admit that you could ask other bloggers about guest posting. Some of them might give you a hint on where you can ask for submitting your post. I don’t hesitate of doing that and it gives me positive results. Before you send the inquiry, you should discover the blog you are interested in. Look through what topics the blog accepts; are the articles commented and shared well; is there a guest post guideline. These features will help you understand of what you should write in your inquiry. I recommend you to send the topic of your post with a few details about it first. Don’t send the article at once. First of all, you should clarify what exactly the blogger needs. His or her comments might help you to ‘chart a course’ and write the piece of content that is in-demand (or correct the one you’ve already written). This service helps me a lot. As you’ve probably mentioned I am not a native speaker, thus it is essential for me to correct the mistakes I make. Use this tool for capitalization titles in your article. If you want to write in a pure English language, thus this service is for you. 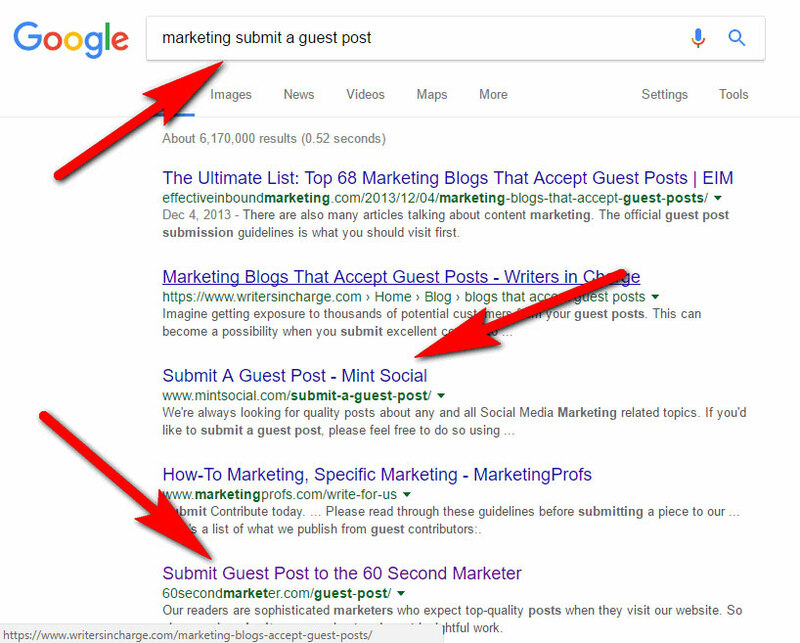 Taking everything mentioned above, I must say that guest posting is your opportunity to share some knowledge, build your credibility and, of course, bring more traffic to your website. Please, don’t forget to comment and share these tricks.